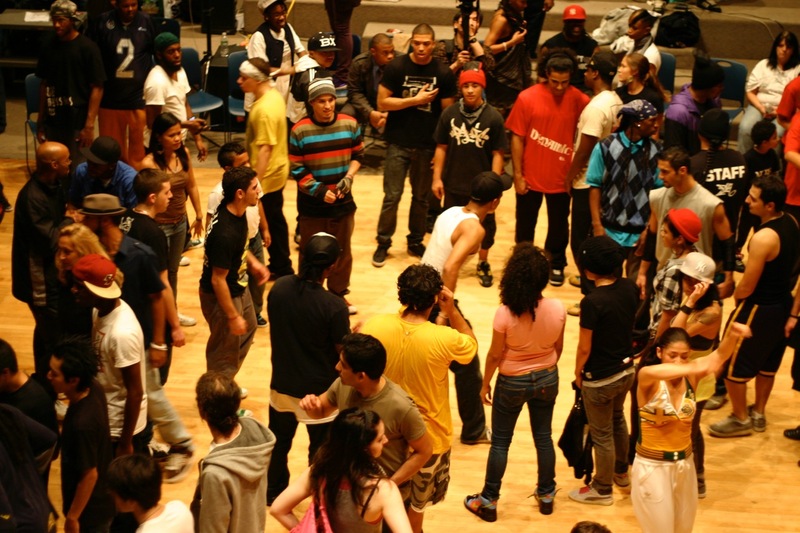 A cypher is a dance jam that comes from hip-hop / street dance culture. You’ve seen them on music videos and dance movies. A bunch of dancers standing and crouching around a circle, as one person goes in and grooves to the beat. 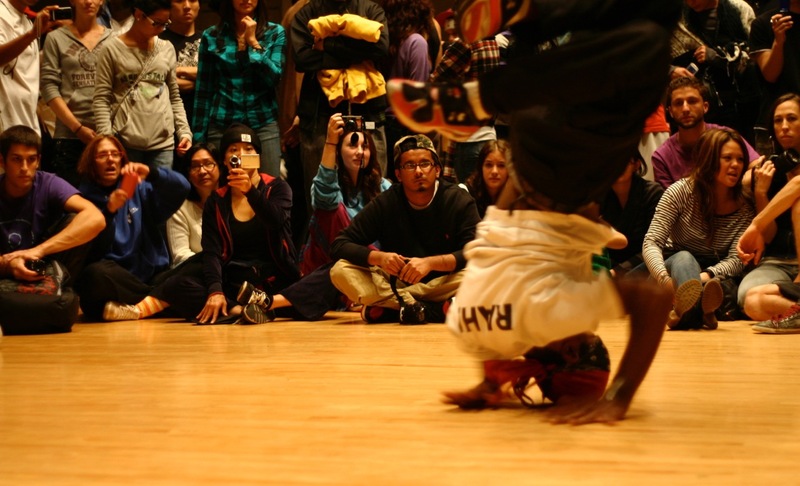 Most people think of cyphers as a b-boy / “breakdance” thing. It’s not, that’s just how it’s popularly portrayed in the media. Cyphers happen among practitioners of popping, house, vogue, waacking, krump, turfing, new style hustle and Chicago footwork, among many forms. Here’s a house dance cypher from the early 2000s. And a turfing and popping cypher from a 2012. So how do you dance in a cypher? It might seem obvious: you go in and dance. How hard is that to understand? I agree with all that. But for those that have actually attempted to jump into a cypher, it takes more than just knowing the rules to go in. It takes courage and preparation. What I would like to share are a few practical tips that help me get over my own fear of dancing in a cypher. I’ve broken them down into three stages: Before You Enter, How to Enter, and After You Cypher. There are lots of ways you can prepare before you enter a cypher. Going in alone is scary. But if you have your friends around you, cheering you on, it’s a lot easier. My friends and I have a rule that if your friend is in the cypher, you cheer for them as loud as you can, no matter what. All cyphers have their own energy, their own dynamic. Is it playful, aggressive, or technical? Are people breaking, popping, or vogueing? Knowing is half the battle. If I see a cypher that is basically several b-boys trying to one-up each other doing crazy powermoves, I probably won’t enter. But if there is a cypher of house and freestyle dancers joyfully sharing the groove, I will happily go in. The easiest cypher to enter is the one you start. If you bring your people, you can just make it happen by forming a circle and having each person go in, in turns. Done, son. So how do you know when to go in? It’s a kind of complicated question that involves understanding the music, social dynamics, and your own abilities. But here are some tips. If you have a friend that is experienced cyphering, have them go in, and then call you out. You can both stay in and do call-and-response, or you can trade phrases. There’s nothing more freeing than just having a friend to bounce moves and energy off of. Isn’t that what social dancing is about? I like to go in as early as possible. Like I will arrive at the club, put my stuff down, and go in. Typically, I try and get there before lots of the truly badass dancers show up. Going into a cypher when there’s just 3-4 people casually sharing moves is a lot easier than a packed club with dozens of people crowded around a circle of ridiculously talented dancers. By the time the “elite” dancers arrive, you will have already gone in a few times, so it should feel a lot less intimidating. Dancing in a cypher is about freestyling. Choreo is a big no-no. But I find it helpful to plan an entrance, which gets me into the circle, and then get out of my head and just dance. An entrance might be a b-boy toprock, or a vogue sashay, or literally walking in a circle. It doesn’t matter, as long as you enter with purpose. How long to stay in is largely a matter of personal preference, energy and style. It’s more important that you exit clearly and emphatically. If dancing is communication, your cypher exit should be a period or an exclamation point, not “…”. For a b-boy, that is typically a pose and a walk-off. I like to hit the end of a phrase, and then float out of the center. Another awesome way to exit is to invite someone else into the circle. When you clearly exit, you give the audience an opportunity to respond, to cheer, to clap, whatever, and signal to the circle that someone else can enter. Nothing is worse than a dancer who doesn’t tells the others that he is finished, sort of half-dances in the cypher and half-dances on the sidelines. Your job isn’t done after you go in the cypher. You still have a responsibility to keep the cypher going. Some people just peace out after they finish in the circle. That’s pretty rude and self-centered. Encourage the other dancers, call people out, cheer for the dopest moves, push out the drunks. And of course, call out “Nooice!” as often as possible. Because otherwise the cypher will die. Typically I will go in once just to get the nerves out and get a read on the crowd. I don’t stay in long, just long enough to feel the music and express myself a little. After a few rounds, I’ll go in again and dance full-out, expressing myself more fully. I guess I shouldn’t peace out without at least one video of me in a cypher. Here I am dancing in Oakland last July at Sol House. Good times. I hope you found these somewhat random ideas helpful. I know it’s scary. But like everything, it’s less scary the more you do it. Every time you confront that fear and do your thing, you master that fear a little better. It won’t happen overnight, and won’t ever really go away. Even seasoned, battle-scarred street dance legends still get “cypher-scared.” But don’t let it dominate you and keep you from expressing yourself to others. Again, I still consider myself a baby dancer (despite having lots more birthdays than pretty much every other dancer I dance with.) If you have a tip or a trick that helps you go in and feel better about being in the cypher, please share!